Save on MicroCare’s MCC-CBCSK ESD-Safe Circuit Board Cleaning Station Kit. Just use our FPF011516 Coupon Code (auto applied) to get the discount. This Featured Product Friday (FPF) promo is valid from today, January 15, 2016 through Sunday, January 17, 2016. 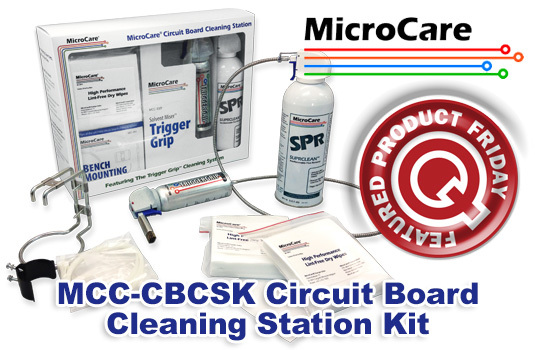 The MicroCare MCC-CBCSK Circuit Board Cleaning Kit provides all the materials needed to economically clean circuit boards at any workbench or workstation. Use the Featured Product Friday discount code as many times as you like while it is valid—and you’re encouraged to share the code with your friends and colleagues. For further questions about Featured Product Friday, please read our informational blog post, call us (800-966-6020), or send us an email. Please note: This promo is valid only at QSource.com and expires on January 17, 2016.